← Anti-nuclear stall in Wrexham: Free Bradley Manning! Click on the picture to view large size. Right click and choose ‘save as’ to download. Gareth Peirce’s latest book “Dispatches from the Dark Side – Reflections on Torture and the Death of Justice” is a selection of essays about the perversion of justice by the State and its extreme and damaging consequences for the victims: the examples chosen include complicity in torture, framing innocent people, indefinite detention without trial, and cruel and unusual punishments of the sort Bradley Manning is being subjected to at the mercy of the US: long-term solitary confinement, deprivation of basic rights, humiliating and degrading practices, torture by any other name, all designed to ‘break’ the prisoner and deliver the desired result by way of an admission of ‘guilt’, agreement to give evidence against another person, acceptance of a plea bargain etc. 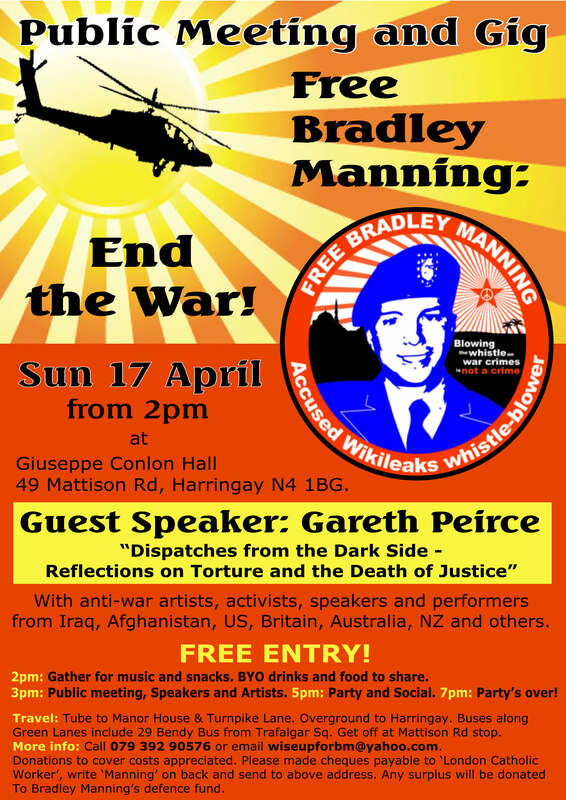 Gareth, who has represented many such victims herself, including the Guildford Four, Birmingham Six and any of the British former inmates of Guantanamo, will give a talk at the public meeting under the ‘Dispatches from the Dark Side’ heading. Don’t miss it. This entry was posted in Announcements, Manning. Bookmark the permalink.